The director can format a tourney bracket in a number of different ways. All tourney brackets are single elimination brackets by default. After the entry deadline, the director first decides if the division needs to be combined with another division. In cases where only a few people enter a specific category, sometimes it is better to combine the smaller division with another division instead of canceling it. Multiple divisions can be combined into a single division, then that tourney bracket can be formatted in any way desired. A small division with no other reasonable division to combine with may need to be canceled. One draw option is whether a bracket will have a 3rd place match for losers of the semi final round. When setting up the tournament template, there is a global option for all tourney brackets to either have or not have a 3rd place match. The director can override the global setting for any tourney bracket. Some elimination brackets will have an option to have a consolation bracket for early round losers. By default, all divisions start with no consolation. Tourney brackets can also be converted to different formats such as a heat sheet, a round robin schedule, where everyone plays each other in their division, a group pool play bracket, with a multi or single playoff bracket, and double elimination brackets where the competitor must lose twice before being eliminated. 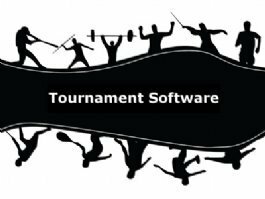 View a complete list of all the tourney bracket formats that are available in the R2sports software for tournaments .